Those who remember my review of the binaural audio drama Sticks might think that ZBS is the only game in town when it comes to 3D audio. This couldn’t be farther from the truth. In 2010, the Wireless Theatre Company debuted their 3D Horror-Fi line of titles: The Intruder, The Passenger, Blood & Stone, Curse of the Wolfman and The Cask of Amontillado. Today I’ll be review two titles from this “first wave,” along with two of their more recent 3D audio releases. 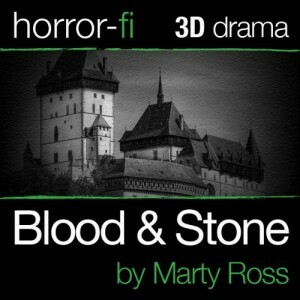 Blood and Stone is a thrill ride for all of its 53 minute running time. Everything’s perfect: The plot, the acting and plenty of twists to keep things interesting. The volume is admittedly low due to it being a 3D audio production, but it’s not as bad as it was in Sticks. But, in all fairness, this production benefits from digital recording technology and modern binaural equipment that simply was not available in the time of Sticks’ creation. That said, listening through headphones are the best way to experience this (and all 3D Horror-Fi productions). Interestingly enough, there’s no evidence that the “Blood Countess” bathed in the blood of her victims! In The Passenger, a couple’s drive through the woods is interrupted when they come across a man who was hit by a car. But not long after they load him into the car to rush him to a hospital, the supposedly “injured” man reveals his good health…and two knives (which he quickly presses to their throats). Now they’re at the mercy of a dangerous man with less than noble intentions. Two questions quickly spring to mind: Who is this man and will the couple escape? As was the case with the last audio drama, this production always keeps you guessing. 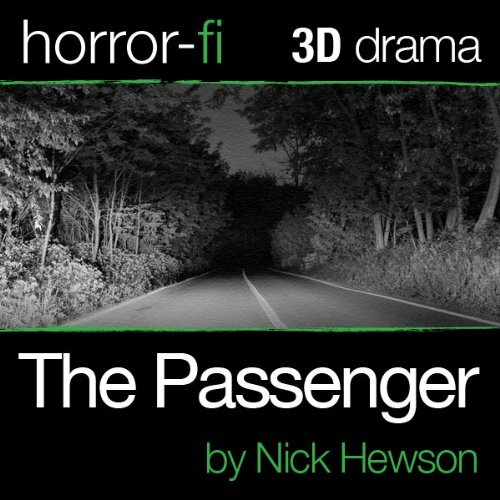 In addition to packing in a lot of suspense into its 16 minute running time, The Passenger goes the extra mile by making it so that the listener experiences everything from the husband’s point of view. This effect is enhanced by that particular character only occasionally murmurs rather than speak any lines. The use of binaural audio is great, especially the scene when the knives are pulled out. In fact, it’s good enough that it even works fairly well even without headphones. The River starts off pleasantly enough with a couple talking. But we get a hint of unease when Debbie mentions seeing Peter at night, along with noting how water and fish come out of mouth when talks and he smells of the sea. Convinced that Peter is just a hallucination, Jack convinces her to discuss her former lover’s fatal boating accident in the hopes that doing so will end her bad dreams. But this fails to work, as she senses Peter’s approach. Is he really a hallucination, or is he something else? Although its 28 minute running time admittedly does fly by, it does linger towards the end and could’ve stood to loose a few minutes. The story’s ending is pretty easy to predict after Debbie finishes her flashback, which is unfortunate given the unpredictable nature of the prior two audio dramas I’ve reviewed from this series. On the plus side, the use of splashing sound effects is extremely effective. Like the The River, the script lingers toward end and would have benefited from a little trimming. I would have loved for them to cut down on all the whining and pleading Jeff does. Sure, it’s realistic, but it’s also incredibly tiresome and made the 22 minute running time seem much longer (and not in a good way). I actually started hoping that the autopsy would hurry up and happen so that it’d be all over. I will give it credit for the interesting effect applied to his voice after his heart attack and the use of musical transitions definitely set it apart from the rest of the 3D Horror-Fi titles I’ve reviewed. I was also impressed at this particular play’s higher volume than the others. I did like the attempt at shaking things up towards the end, as it did add some extra suspense. As touched on earlier, all of these productions have lowish volumes due to their binaural nature and are best enjoyed while wearing headphones. This is both due to the volume and because the 3D audio effects are simply amazing. Given their adult themes and often gory scenarios, none of these productions are suitable for children. It’s also worth noting that they’re all British, so expect plenty of accents. Just think of them as Hammer Films for your ears. Overall, I preferred the “first wave” titles to the most recent releases in this line as they offered both tighter scripts and more in the way of excitement (and always kept the listener guessing). That said, I do want to encourage the Wireless Theatre Company to continue with this line, as they’ve definitely mastered 3D horror audio. Here’s hoping that their future releases have more scares in store for us all! Special thanks to the Wireless Theatre Company for the review copies!